A unit load device, or ULD, (ULD) is a pallet or a container. 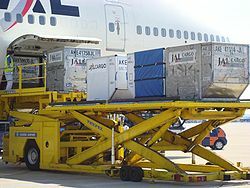 It is used to load luggage, freight, and mail on wide-body aircraft and specific narrow-body aircraft. It allows a large quantity of cargo to be bundled into a single unit. Since this leads to fewer units to load, it saves ground crews time and effort and helps prevent delayed flights. Each ULD has its own packing list (or manifest) so that its contents can be tracked. There are two kinds of unit load devices: pallets and boxes. The boxes are similar to shipping containers: they are mostly made with metal (usually aluminum) and have standard attachment points that let them be moved easily. The pallets are usually metal with sides that attach to a cargo net. Below is a table of sizes of ULDs. The volume listed is the internal volume, the size of the inside of the container. Volume indicated is internal volume. ↑ "747-400/-400ER, Airplane Characteristics for Airport Planning", Section 2, Boeing, May 2011. ↑ "767-200/200ER/300/300ER/300 Freighter/400ER, Airplane Characteristics for Airport Planning", Section 2, Boeing, May 2011. ↑ "Shipping & container guide - Help & additional info - International cargo - Air New Zealand cargo | Air New Zealand". Air New Zealand. Wikimedia Commons has media related to Unit load devices. This page was last changed on 11 February 2018, at 18:30.